As Seen in Quilting Arts Magazine! Learn Cindy's tips and tricks for creating beautiful ice dyed shibori patterns. Mandalas and more with this fun filled fabric dyeing technique! These amazing dye kits take you beyond the primary, secondary and tertiary colors, and into a world of inspiration. With this kit, you can dye these beautifully subtle color progressions in just a few hours! Turn 3 colors of dye into 12 step color gradation, and then learn how to get a light, medium and dark value of each color you create. This wonderful kit is the subject of my iquilt video! 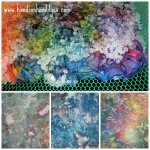 Create amazing crystalized patterns using snow and ice as a medium to dye fabric! Kit contains 3 yards fabric, dye, chemicals, detergent, gloves, dust mask, and an innovative set of tools. Fast, Fun & Affordable, this kit makes 12 unique fat quarters. Explore Intajime shaped resist dyeing with "Welcome to the Fold", an innovative dye kit that includes fabric, dye, and a great Starter Pack of acrylic templates. Additional Specialty templates are also available to continue the creative fun! Arashi Shibori - Pole Dancing! 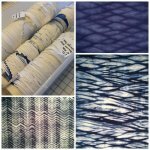 A fresh and modern twist on the ancient technique of pole wrap shibori! PFD Fabric - 44" wide, 100% cotton, mercerized and "Prepared For Dye" is now available by the yard! Dye six shades of one color in a little over an hour! Fourteen colors to choose from. Kit includes fabric, dye, chemicals, detergent, dye tubs, mixing jar, gloves and dust mask! Plus great instructions with pictures! You already have the tool kit from a Six Shade Value Kit, and this is a great way to build your stash! Choose from 14 different colors, 6 shades of each color from lightest light to deep and rich. Fast, Fun and Affordable!